After dazzling both the critics and casual listeners with his debut LP "Moon Observations" in 2014, Dutch production wizz David Douglas returns with a breand new album for 2017. “Spectators of the Universe” is a journey through sun-kissed disco and gentle electronic pop, subtly playing with psychedelic and experimental elements and weaving organic textures alongside more robotic landscapes. 2014’s “Moon Observations” was inspired by a different star-gazer with the same name. 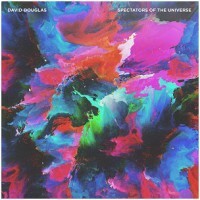 That David Douglas was a 18th century explorer and naturalist, whose writings on astronomical observation has inspired the more modern Douglas’ latest music. Those eleven tracks of beautifully fleshed-out electronica were certainly a worthy tribute, and “Spectators of the Universe” continues the story in blissful fashion. Over the course of ten spaced out dancefloor cuts, propulsive rhythms lead us on a hypnotic journey through zero gravity bass, nebulous synth melodies and dreampop vocals, passing by Air, Daft Punk and Caribou as we head past the event horizon.